AllSides Media Bias Ratings help you identify different perspectives so you can know more, understand others, and think for yourself. We've rated the bias of nearly 600 media outlets and writers. Scroll down to see the full list of media bias ratings. By making the political leanings of hundreds of media sources transparent, AllSides frees people from filter bubbles so we can better understand the world — and each other. Our Media Bias Ratings represent the average judgment of Americans. They are based on blind surveys of people across the political spectrum, multi-partisan analysis and other in-depth analyses as well as tens of thousands of user ratings. Our scientifically-generated ratings are fluid and subject to change over time as new information is gathered and biases change. Unless otherwise noted as editorial content, all bias ratings are based on online versions of news coverage, not TV, print, or radio content. While there should be a difference between the media bias seen in news coverage and the bias revealed in opinion and editorial content, increasingly there is not. AllSides often provides separate media bias ratings for news and opinion/editorial content from the same source. Learn more about our Media Bias Chart. Learn more about how we rate media bias. Rate your own bias and see how you compare to others. Remember, your own bias impacts what you think and feel. For each of the sources below, you have the option to click agree or disagree. Your feedback is extremely valuable when we update our bias ratings. Before contacting us, please make sure to look through all of our all of our ratings, not just our featured ratings, to ensure we have not already reviewed the source you have in mind. You can see all media bias ratings by clicking here or by adjusting the filters below. Still don’t see your source? Send us an email including the source name, details, and how you think its bias should be rated. Adjust Filters Only shows featured sources by default. How do you think the bias of this source should be rated? AllSides has rated the bias of nearly 600 media outlets. Above are some of the most-read outlets in America. Click here to see all. 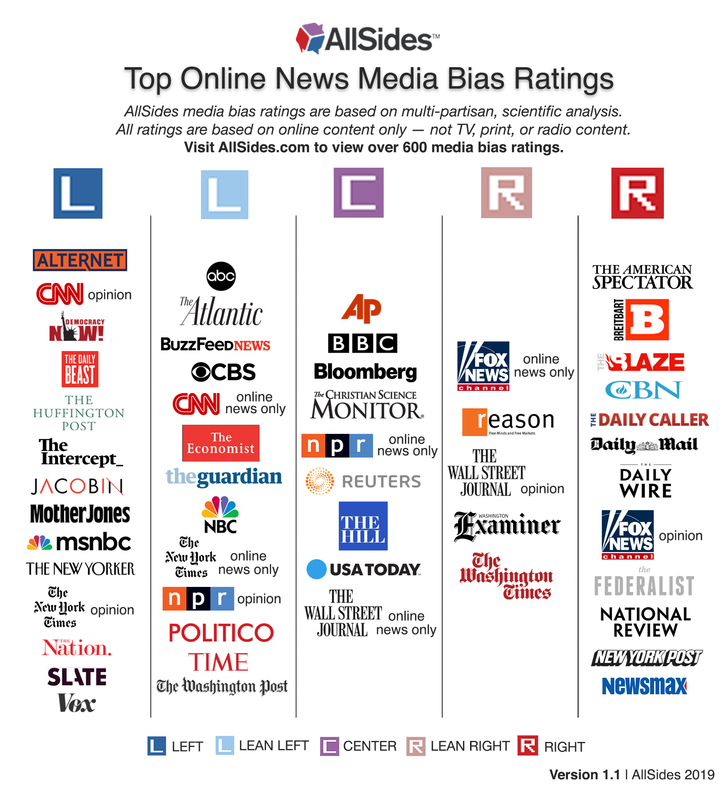 AllSides Media Bias Ratings by AllSides.com are licensed under a Creative Commons Attribution-NonCommercial 4.0 International License. You may use this data for research or noncommercial purposes provided you include this attribution. For commercial use, or to request this data as a CSV or JSON file, contact us.